The Glow effect turns your image into a glow area with a bright soft-edged light or diffuse light region around an image. The Glow effect is useful for creating a shining rim around objects, such as the sun or stars. Clone your layer to display the original image on top of the glow. Allows you to enable or disable the layer. When disabled, a layer has no visible effect on the rendered image, nor on the preview in the Camera, Side and Top views. Inverts the matte used to generate the effect. By default, the effect is applied to opaque areas of the drawing. 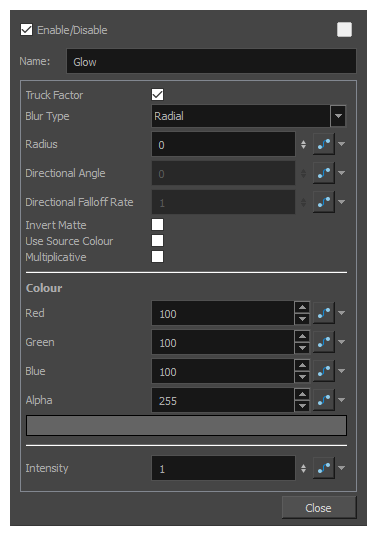 When this option is enabled, the effect is applied to transparent or empty areas of the drawing. Instead of using the colour in the Colour parameters, this uses the colours in the source drawing to generate the effect. Multiplies the colours of the effect with the colours of the background. This intensifies the effect. The amount of red to add to the colour in the background image. The amount of green to add to the colour in the background image. The amount of blue to add to the colour in the background image.